Blackjack is one of the most reknowned casino games and makes a great game to play online at one of the best casinos. You can play single handeded on a table of your own, multi handed or even on a multi player table. Perfect Blackjack is much like the standard blackjack that you will be aware of. There are so many versions of blackjack that sometime it can become a little confusing. Just think of the old favourite Pontoon, or Spanish 21 and you will be on the right lines. 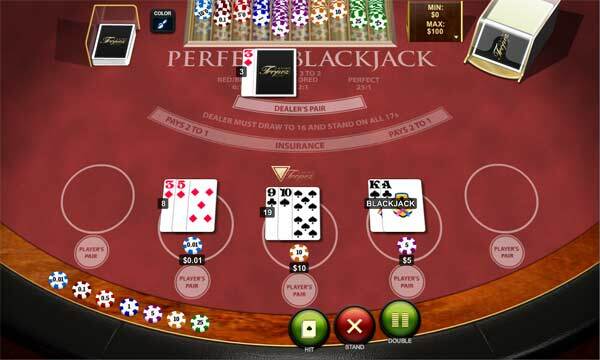 Perfect Blackjack allows you to play multiple hands on one deal. This is a 5 hand table and you can choose to play 1, 2, 3, 4 or 5 hands. You just place a bet for each hand you want to play. You can wager different amounts on each hand if you want. This version of blackjack takes its base rules from the Las Vegas Strip Blackjack. There are a few exceptions. Notable changes from standard blackjack are that the cards are returned and shuffled after every hand, you can only split once, you can double your bet after splitting. The game also offers a PERFECT PAIR side bet that you can choose to play. You can either bet on dealers hand or players hand to be a perfect blackjack pair. A perfect pair is classed as a matching pair from the same suit, then there is a coloured pair or red/black pair.